SHODO is one of the oldest and most profound traditional art forms in Japan, developed and appreciated since the 5th century. The world of calligraphy has its long rich history which went through many possible calligraphic styles and expressions during its over 3000 years existence. SHODO is not only a highly regarded art form in Japan, it is both a skill and an aesthetic. The depth of beauty in SHODO is the result of diverse techniques being accompanied with a flow of brush and ink, essentially with an inner silence/stillness and spiritual concentration. ​"the way of artistic hand writing or beautiful writing". 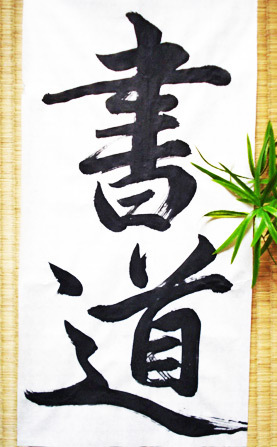 Another meaning is "the art of traditional Japanese calligraphy". It is an ancient art separated from any other creative work. It differs in that its main focuses are simplicity, beauty and - most importantly - a mind-body connection. Shodo’s true calligraphy is achieved by applying the elements of art, line, shape and space. The real mastery of all these elements of art and skill requires a lot of practice and connection with your inner self. What I found most difficult for learners is to have a MUSHIN 無心 : the state of no-mind, non-thoughts, a high level of spirituality and a heart free of disturbances. You can describe this as meditative state. Sho is the art that expresses the spirit of word with the brush and ink "